In my first review for Optoblog, Iâ€™ll focus on the most recent equipment addition to our clinic, the Sonogage Corneo-Gage Plus 1AS. There are a couple different versions out there, the “1” and the “2.” We somehow got the 1AS. Iâ€™m not sure what the AS stands for, but it might have something to do with not having a printer. Sonogageâ€™s website isnâ€™t clear on the different models available, and the complete set of features they list are only available on the “2.” We chose not to get one with a printer because. . .what’s the point? Just write the numbers down in the chart! A few years ago, the docs that used to work in my clinic chose to staple into the chart note the little printout from our ARx/AK instrument. The ink has faded beyond recognition, so in my opinion the optional printer is a waste of money, and Iâ€™ll detail another reason why later. Weâ€™ve had our Corneo-Gage Plus 1AS 6 months, and it hasnâ€™t required a recharge on the battery. In fact, the battery level indicator still reads 100%! Truthfully, we only been using it 1-2x per day on average, but still, the battery life is pretty impressive. The probe has 50 MHz transducer, which is a big selling point because itâ€™s supposed to be more accurate than lesser frequencies. Available on the â€œ2″ is the ability to measure epithelial thickness. Sonogage states they are currently the only pachymeter that does this. Also, the â€œ2″ has feature of automatic IOP correction instead of having to look at a paper table. On the downside, the most glaring inconvenience is that the Corneo-Gage Plus requires pressing buttons 3 different times in order to turn it off. Sure, I can see how you wouldnâ€™t want to accidently turn it off, but requiring two button pushes would be sufficient. Three is overkill and a nuisance. While the cord from the instrument to the probe is 4â€™10â€, that isnâ€™t long enough to reach from my counter to the patient in the exam chair. Actually, I could get one eye, but the other is too far away. Many doctors will not have this problem, though, since my exam lane is probably wider than average. I just have to set the pachymeter on my stool during testing. I canâ€™t imaging they canâ€™t make the Corneo-gage form factor smaller, especially for those of us who didnâ€™t get the extra printer option. After all, the Pachmate DGH55 is a little larger than a big pen. I assume the bulk of the Corneo-gage form factor is from the battery inside. (Iâ€™d love to open it up, but that would void my warranty.) Despite being shoe-box size, it is completely portable between our 4 exam lanes. Now, I will explain why the printer option is a completely useless option that is a total waste of money. The Corneo-gage Plus is continuous read, so you put the probe on the cornea and stay there until you here 5 beeps. Then go to the other eye. In the end you would have 10 readings, the first 5 are for the first eye, and the last five are for the second eye. For each eye, you automatically throw out the first and last readings. The lowest of the middle three readings is the corneal thickness which you record. No averaging is required. That is why I see no point in getting the printer models because you only have to write down (or hopefully type) one number per eye in your chart. Some might say that not having a â€œRightâ€ and â€œLeftâ€ button for taking readings is undesirable. I answer that itâ€™s easy to listen for 5 beeps then switch eyes. No fuss with having to press extra buttons. Itâ€™s a time saver, really. 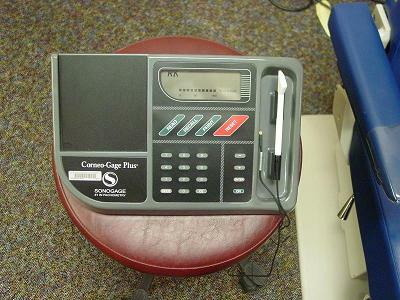 So, why did we choose to buy the Sonogage Corneo-Gage Plus 1AS sight unseen and without a demo? Thomas and Melton, of course. Those two guysâ€™ word is optometric gospel. In fact, to all the drug reps out there, donâ€™t even bother coming to my office. If you want me to use your product, you need to convince Thomas and Melton- not me. Anyway, they endorse this pachymeter, and thatâ€™s good enough for me. Some very useful information came with our Corneo-Gage Plus. The instruction booklet was very clear, helpful, and comes with a handout entitled â€œPachometry Reimbursement Codesâ€ to help you know how to bill. The guideline for billing pachometry is if there is â€œa reasonable expectation that the outcome of corneal pachometry will impact decision-making in the medical management of the patient.â€ So, every glaucoma suspect in your office needs this, and they will allow anyone with a c/d over .3 or elevated IOP to be a candidate for pachometry. While following corneal disease, like Fuchâ€™s, bullous keratopathy, or corneal edema, you may bill for every pachometry reading as long as you documented in your original plan of care the need for repeat pachometry. Reimbursement assumes a bilateral procedure, so don’t try to bill for one eye at a time. Just plan on always taking readings from both eyes. Medicare only reimburses a small amount (~$12) and only once in the lifetime of the patient with glaucoma. Anyway, thumbs up for the Sonogage Corneo-Gage Plus 1AS (no printer). If I did a lot of LASIK co-management (or CRT? ), I would opt for the â€œ2″ for it’s epithelial thickness measuring ability. If fact, I would tell everyone to opt for the “2” anyway because it has the feature where you press a button on the selected measurement, and it tells you the adjustment number to find true IOP. Thanks for the review. I’ve used this pachymeter before at other rotations and practices I’ve worked at. I was trying to decide between all the pachymeter choices out there (and prices) but this review just confirmed the purchase of this model.